Far and Wild Safaris cc is a registered Close Corporation since 1993, staffed by an enthusiastic, knowledgeable and responsible team. The majority of whom have been involved with wildlife and Zulu culture of southern Africa most of their lives and tourism in general for many years. Controlling authorities have been joined, in particular SATSA, Durban Africa and the 'Battlefields Route'. All necessary industry criteria have been met with attention to our client's requirements with their satisfaction, a priority. Close association with certain travel agents and other service providers has been established over the years which ensures value for money and a competitive edge. 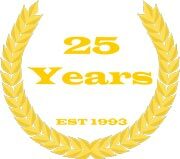 A reservations office based in the centre of Durban is on line, telephonically, by fax, e-mail for our clients and we are in contact with our vehicles. Prices are quoted in South African Rand. We accept Payments via Direct transfer and by our secure Credit Card payment facility through PayGate (Pty) Ltd.
Credit cards accepted are: MasterCard with SecureCode, Visa with Verified by VISA, Diners Club and American Express. We presently have a number of SATourism registered professional tour guides used on a regular basis. 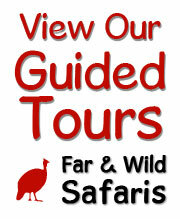 Our guides are registered with SATourism and are highly qualified in their fields. We have access to experts in ecology, dendrology, ornithology, Palaeoanthology, San and San Rock Art, Zulu culture and the battles of the Anglo-Zulu and Anglo-Boer Wars, whilst our regular guides are highly experienced, 'peoples persons' with a fund of general knowledge on the area, its history and fauna and flora. Scientists in specialised fields are available for input as required. Formal presentations on various topics are readily arranged. German and French guides for the various language groups are used. Our general mode of transport is in air-conditioned vehicles. Open game viewing vehicles carry seven to ten clients. We generally prefer a maximum of 6 clients in the mini-busses. The vehicles are maintained meticulously to Department of Transport standards. For larger groups luxury busses are hired for the duration of the tour. Open 4X4 game viewing vehicles would be used in the game reserves where appropriate. Our wildlife tours are to the principal protected areas of South Africa and especially the excellent game reserves of KwaZulu-Natal, the Kruger National Park, as also game reserves in Botswana and Zimbabwe. Here you will be able to view the rich diversity wildlife. Should seeing the 'big five' be a priority then to improve on your chances, we suggest visiting a lodge where these Big 5 animals are tracked. Specialised tours are offered and we are able to provide dedicated scientists in most fields as required both in South Africa and in our neighbouring countries. Zulu cultural tours, visiting a working Zulu village where you would have an interpretation of the lifestyle of the traditional Zulu portrayed. From the design and building of their homes, their apparel through to their traditional means of defence and how their weapons of war were made. Their spiritual and social customs would also be acted out or explained. Visits to townships and meetings with local people could be arranged. In KwaZulu-Natal, a great deal of the area traversed falls into the traditional homeland of the Zulu and one is easily able to see the way these people now live. Specialised tours covering the historical Anglo-Zulu and Anglo-Boer Wars are conducted under the guidance of authorities on the subject. Hluhluwe Imfolozi / Umfolozi Park - Home of the white rhino, the BIG 5 and its vast wealth of fauna and flora. Mkhuze / Mkuze Game Reserve - Abundant birdlife, waterways with hippo and crocodile. Walking trails in search of Black Rhino. We prefer a few selected Private Lodge Venues in South Africa. In Zululand there is Phinda, Thanda and the Zululand Rhino Reserve with their various Lodges. Others are Amakhosi Lodge, Mkuze Falls, Falaza, Bonamanzi and Zimanga. 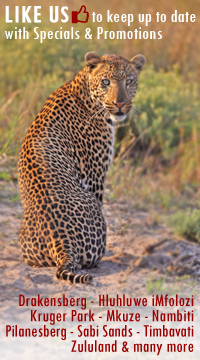 For the finest Big 5 sightings and in particular, Leopard, then its Lodges in the Sabi Sand Game Reserve or the Timbavati which are open and adjoining the Kruger Park. For a luxury Lodge experience inside the Kruger Park thee are a number of Private Lodges on their own sole use Concession.